Introducing: Random Task Force Operations! When Star Trek Online enters the Age of Discovery, we will be introducing a whole new method of interacting with the PvE group content available to players. Same Great Content, Even Better Name! Alongside the new functionality we will discuss in this dev blog, we have decided to retire the rather bland moniker of “queue” to describe our PvE group content. Instead, we are going to begin calling them by the term “Task Force Operations” (or Task Force Ops, or TFOs). 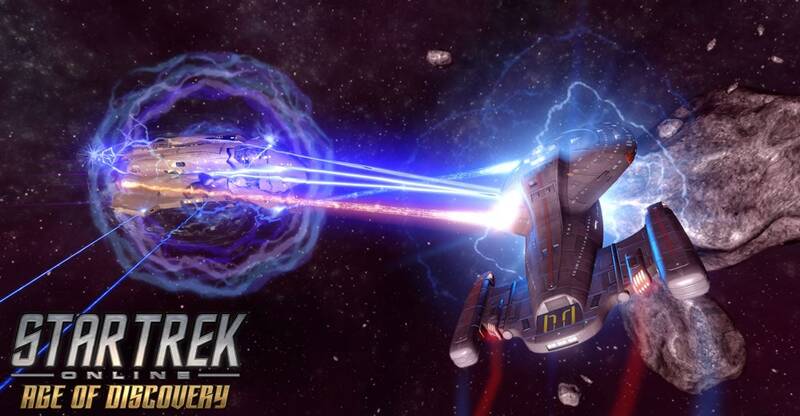 This update to the terminology is meant to relay context for how this content exists within the world of Star Trek Online, making it more obvious that the Captains you are playing are participating in actual in-world activities – skirmishes, strike teams, defensive maneuvers, simulations, and more. We also hope that this rebranding may generate a greater sense of excitement and engagement than what was evoked by the old term. After all, a ‘queue’ in the real world is just a line for something, and that something is frequently a chore. When was the last time going to the bank or DMV was something you got excited about participating in? We certainly hope that playing Star Trek Online is more exciting and enjoyable than that, and its naming conventions should reflect it! The act of opting in to participate in a TFO will still be referred to as “queueing” or “matching” as this renaming effort is only on the content itself, and not the act of getting to it. Have you longed for a greater sense of variety in your daily dose of Star Trek Online group content? Do you ever just want to log into the game and play, without feeling picky about what it is? Have you ever wanted to participate in a forgotten piece of older content, but found the prospect of forming a team cumbersome, if not downright impossible? Captains, have we got just the system for you! With Season 15, we are introducing a new feature to TFOs: Random Task Force Operations. Entering into a Random Task Force Operation will be as easy as clicking a single button, located prominently within the PvE Group Content interface. Options will exist to opt into Normal Difficulty or Advanced Difficulty content, allowing players some customization for the type of group content they want to opt into experiencing. Aside from this choice of Difficulty, the Random TFO system asks players to kick back and embrace the whims of fate, as they are whisked away to one of our many TFOs, chosen on their behalf! Once opted into the Random system, players are first matched up with unfilled TFOs that other players have manually selected, on a first-come-first-served basis. If no manually-selected TFOs are awaiting more players, the Random TFO system will select one from the list of eligible content, and begin filling that instead. In this way, we hope to see many TFOs that players find difficult to fill under the current system suddenly bustling again as players opting into a Random TFO are teamed up alongside enterprising players seeking a wider variety of content. The thrill of discovery is everywhere, as you won’t know which content you’re about to experience until you’ve arrived and are ready to conquer the task(s) set before you! Each set of Randoms (Normal and Advanced) includes matches from both Space and Ground, so be sure that both your Ship and Captain are fully equipped and ready before you take the plunge. You may participate in Random TFOs without any cooldown or lockout period, immediately re-entering a new one after the previous TFO is completed. Individual matches will still have their own existing cooldown timers, so you can’t end up in the same TFO back-to-back. AFK and Leaver Penalty lockouts also still exist, and apply to Random activity as normal. Additional exclusions may be made on a case-by-case basis. While we don’t intend on publishing a complete list of what is and is not included, we feel confident in saying that only Content that meets the standards of our modern players will be eligible for Random matchmaking. We hope to ensure that sacrificing the element of choice when playing group content will always feel exciting and rewarding. Of course, no experience like this would be complete without offering an incentive for participation! Completing a TFO via the Random system will grant BONUS REWARDS, in addition to whatever the TFO itself rewards for completion. These rewards are granted immediately upon success, and there is no limit to the number of times that you can receive them. Each BONUS REWARD comes in a bundle that contains both an amount of Marks of your choice, and Dilithium Ore. The amount rewarded is greater, if you are fortunate enough to earn the rarer tiers of rewards. The BONUS REWARDS for completing a Random TFO are different depending upon whether you completed one on Normal Difficulty or Advanced Difficulty. Within each of these separate reward categories, there is also a range of potential prize amounts, allowing each Random TFO completion the potential to feel like a major windfall, just for playing the same content you’ve already come to appreciate. Random TFO Reward Bundles cannot be traded – they are bound to the character that participated in and completed the TFO. What excites you, or makes you anxious, about the prospect of opting into Randomized content, and why? Which existing TFOs do you hope see more play time under this system, and why? Which existing TFOs would you consider yourself ‘unlucky’ to be placed in, and why? Be sure to try it out, and let us know what you think! And when Random TFOs finally arrive alongside Age of Discovery, we hope you’ll be as excited to explore this new system as we have been about getting it into the game!